It’s Mother’s Day Weekend, and I know you might be looking for a little something special to make mom. But what if you are not exactly kitchen-abled? This is THE easiest meal, with different flavors that come to life in this dish. Feel free to make some gluten free pasta or just serve with extra kale/tomatoes/cauli. First, chop up an onion, place in covered pot with olive oil. Put a pinch of salt on top of onions. Let simmer on stovetop. On your cutting board, evenly slice chicken in a way that it could be folded back and forth. Line chicken vertically with one line of cauliflower, kale, and tomatoes. Cover chicken back with the one side. Season top of chicken with fresh basil, pink salt, garlic powder, & oregano. Place chickens right on top of onion. Option to cover rest of chicken with leftover kale, tomato, and cauliflower. Let bake for 30-40 minutes, check halfway to make sure chicken is brown. Sprinkle some mozz on top before serving if you are able to tolerate dairy, or have vegan mozz! This is seriously the easiest and most simple meal! Celebrate mom or yourself this weekend with this hearty and yummy dish. One of my favorite findings at the Natural Products Expo was Sun Butter! Sun Butter is made from sunflower seeds into the yummiest, creamiest spread. I am not yet a parent, nor do I have a nut allergy, but I LOVE the taste of Sun Butter! The decadent texture and how it just pairs with literally anything is more than I could ever want in a treat. It is non-GMO, free from the top 8 allergens, 7 grams of protein per serving, and mineral/vitamin packed! My favorite product has go to be their on the go packs, because as a busy nurse, I want to have a healthy snack in my lunch bag at all times. It pairs really well with a quick apple, and I definitely feel satisfied. I also love that they have an organic jar that has nothing else in it, but straight up organic Sun Butter. But down to business. I saw a jar of Sun Butter sitting next to a container of strawberries I had just purchased. The possibilites of what could be done with these ingredients blew my mind. Enter the chocolate covered strawberry BROWNIE. It’s definitely not just another brownie recipe. They taste like a chocolate covered strawberry with a chocolate surprise on the bottom. Preheat oven to 375. Spray brownie pan with coconut oil. Clean and thinly slice strawberries. Put coconut flour, all purpose flour, salt, baking powder, cacao, baking soda, together in a mixing bowl and sift. Blend 3 beaten eggs, apple sauce, butter, and vanilla extract together in a standing mixer. Evenly spread the mixture in a brownie pan. Then, take a butter knife and swirl SunButter over the top of the brownies in any pattern you like. Bake for 18-20 minutes, or until you check with a toothpick and nothing is visible on toothpick. I recommend letting cool for a few minutes, and then slicing. While brownies are baking, melt butter in a stovetop pan. Once butter is bubbling, pour in chocolate chips, mix until no more chunks are visible. Place on low heat and continue to stir so that chocolate does not burn. Once brownies are cooled, place strawberries over the top. Then, spread chocolate mixture over the brownies. Again, drizzle SunButter over the top of the melted chocolate. I just did straight lines, but you can do whatever pattern you feel. You can also coat the entire top with SunButter. Add ice cream, and dig in! I keep these covered in the fridge and warm up when I’m hungry! Which I plan on doing right now. Let me know if you try. And as always—live out your rainbow! Thank you to SunButter for providing me with their delicious products that made this recipe happen. The sun is finally shining, and I have a treat for you to bake with the windows open! You’ll have a smiling heart and a smiling belly. Recently, I’ve had some requests for some vegan and chocolate free recipes! I know who doesn’t want chocolate!? With Easter on the way, these are the absolute PERFECT treat. Only allll the goods. These are seriously dreamy. Eat these for brunch, and save your spring time chocolate goods for dessert! Or eat these at both times. I know we will! Blend all wet ingredients together really well. Then blend all wet into the dry ingredients. The consistency should be creamy, but not too wet. Spray muffin pan with coconut oil. When putting mixtures into cups, fill to the top. Don’t be worried about overfilling, especially if you want nice and big full muffins. Sprinkle some extra sugar on the top of each muffin. Bake for 15 minutes, let cool for 5! These would be amazing with some coconut yogurt on top, or drizzled with nut butter. 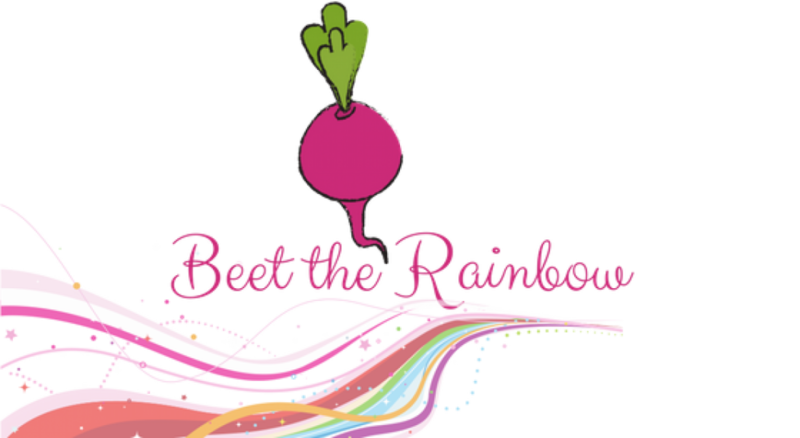 live out your rainbow! lots of hugs and sunshine. I will forever be the girl who only loves football so that I can stay in the kitchen and whip up the most delicious Sunday dinners and treats. Unfortunately, we are about to walk into the weekend where Sundays make a turning point, and the meals we associate with gamedays are forgotten about until after Labor Day. This gave me the perfect excuse to whip up an INSANELY delightful dessert that will be the hit of all your Super Bowl Festivities: Super Bowl Superfood Blondie Bars! Grain free and packed with protein. I think I’ve found my new yearly tradition. You will never know that these are so nutrient dense, and your guests will be WOWED by these drool worthy treats. Let me know if you try! Have an amazing Super Bowl weekend! Heat oven to 375, grease a brownie sheet, put all dry ingredients together and mix. Mix together all the wet ingredients (I do it one at a time with my Kitchen Aid stand mixer). Lay mixture flat into brownie sheet, cook for 22 minutes. Let sit for 10 before eating! Please note that the writer of this post may make a commission off of any products linked in this post. All proceeds are used to continue the growth of Beet the Rainbow. Thank you for checking it out! Check out my Instagram page @TheMindfulMichelle for more. Maybe it’s the new wife or the food blogger in me, but a goal of mine in 2017 was to learn how to roast a whole “bird.” Even though I worked on Thanksgiving, I made it my mission to attempt to provide a traditional Thanksgiving dinner for my husband. Had the oven not started to go on fire, it might have been successful. Either way, I am excited to have learned how to prepare and cook a full bird. Whenever I have picked up a whole chicken (in the raw meat area, NOT the already cooked one, but thanks Shop Rite and Whole Foods for having antibiotic free roasted chickens), I could not even wrap my head around the complexity of it. Turns out, roasting a turkey or a chicken seems much more intimidating than it really is. The prep takes about 10 minutes TOPS, and the actual cooking time, while long, does not involve more than putting it in the oven, and waiting for it to be done. Apart from the ease of actually roasting the chicken, let’s talk budget. Organic, boneless, chicken breasts are extremely expensive per lb. I’m talking $7.99 if you’re lucky or $9.99 if you’re not. A whole chicken, organic, at Trader Joe’s is $2.99/lb here in Jersey. At Whole Foods this week, for $1.99/lb. This meal got 2 dinners, 2 lunches, 6 bowls of soup. So we are talking 10 meals for $14.00 worth of protein. That’s $1.40 a meal! Granted, that’s just the protein, but the sides don’t add that much extra. Are you sold yet? While I *didn’t* do this, you can easily make this a one skillet meal by roasting the potatoes in the skillet as well as some Brussel sprouts to maximize time efficiently, especially for meal prepping. Thaw out chicken, when ready to prep the meat, leave out for about 20 minutes. Take out Giblets. Preheat oven to 375. Place on large cutting board and pat dry with a paper towel. While oven is preheating, place cast iron pan into oven so it gets warm while the other ingredients are being prepped. Chop celery, carrots, and yellow onion into long pieces, chop garlic. Take avocado oil and coat entire chicken. Stuff inside of chicken with onion, garlic, rosemary, thyme, salt, pepper. Place the same mixture around the chicken, coating it evenly with salt, pepper, rosemary, garlic powder. Slice one lemon into thin pieces and place around the chicken. Take out pan, place it on stovetop so that nothing burns. Coat bottom of pan with avocado oil, onion slices, carrots, celery, garlic cloves in the bottom of a cast iron pan. Place chicken right on top of that divine mixture, put whole chicken in the oven covered with foil for one hour. For the next 1.5 hours, leave uncovered. It should take up to 2.5 hours for the chicken to be moist, and NOT dried out. Take out chicken, check internal temperature which should be 165 F for safe consumption. Allow chicken to cool before slicing, dicing, and devouring. Enjoy this meal that you will feel SO good about, and let me know what you think! Soup recipe to come in next post!